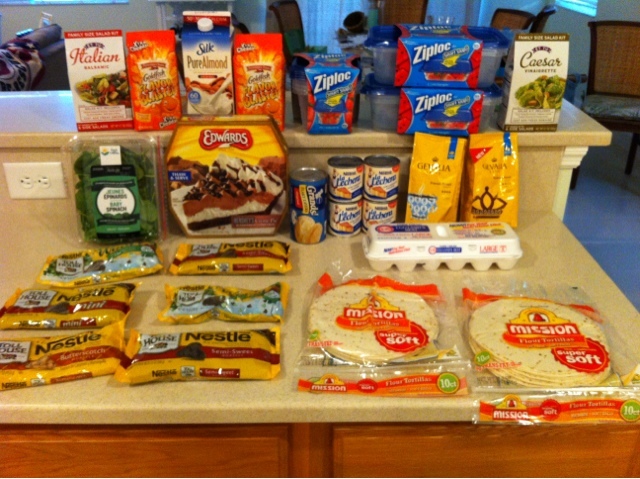 Can you imagine paying almost $100 for these groceries. I was mind blown when I realized how much these would have been out of pocket with no sales or coupons. I didn't even buy any meat or much produce. To think back to the days when i would be been ok with paying full price for these things makes me cringe. This week was an amazing shopping week for me. I hit up CVS and saved 74% and then the stars aligned for me at Publix today and I was able to advantage of a gift card with purchase deal, a $5/$30 Winn Dixie coupon and tons of sales and coupons. I also had two coupons for FREE products from blog promotions and used three Publix Yellow Ad. Flyer FREE product coupons too. I was so excited when I called my Publix's and they told me that they would honor the recent FREE $10 gift card when you make a $50 purchase coupon from Target. Since it was a gift card deal coupon, I could also use the money off total purchase coupon as well. I was thrilled to stock up on baking supplies and Justin is very happy with cheap coffee. I may run back and do another transaction later this week for just chocolate chips and free ziploc containers so I can be completely stocked for the year. I thought I had bought enough baking chips during last year's sale but I ran out by June. This year I am making sure I buy enough during the holiday sales to last me the whole year. Made these all FREE plus a $1.40 MONEYMAKER! Used a coupon for a FREE product from a blog promo, make sure you stay tuned for a chance to win the same coupon! oh i'm moving to wherever you are-- these coupon deals are amazing. I'm not sure that our Hawaii coupons are as good/ work the same way strange, though as cost of living is so very high we sure could use good coupons. Wow, that's great. I want to start couponing but really don't know how. Yay you! I am your newest follower and was hoping that you would follow me back!